See where to find all 56 collectibles in Call of Duty: Black Ops 3 and earn the 'Curator' trophy or achievement with these locations. Instead of intel, this year's Call of Duty has collectibles. From swords to radios and propaganda posters, just about anything can be a collectible in Black Ops 3. If you're hoping to get that 100% completion or just want another reason to earn campaign XP and replay levels, we've got all the collectible locations listed below. Take a break from the collectible hunt and play yet another hidden zombies mini-game with our quick guide showing you how to unlock Dead Ops Arcade 2 in Black Ops 3. 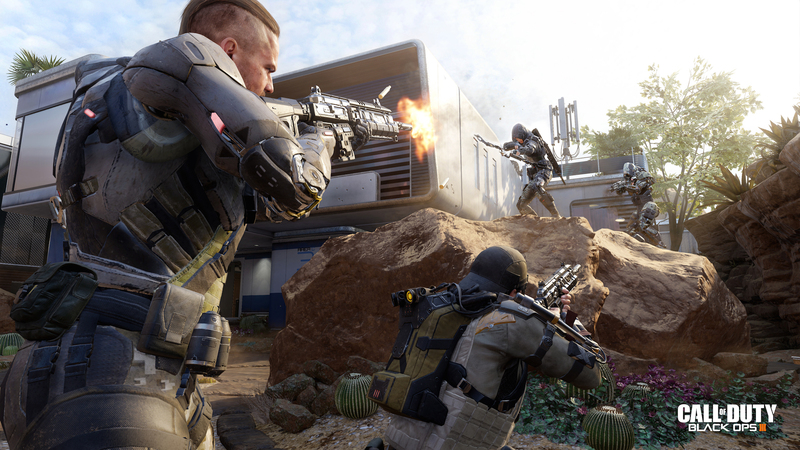 There are 56 collectibles spread across 11 missions in Black Ops 3. A white icon will appear when near the collectible location. Check the pause menu to see the order of collectibles in your current mission. Intel #01: Right as the mission starts, you'll clear a group of soldiers. Go downstairs, duck under the wheels, and look behind the desk to get the first collectible. Intel #02: Sneaking into the underground facility, Hendricks opens a door into a security station and shoots two sitting thugs. Before (or after) using the computer terminal, look opposite the screen to spot this collectible near the window, to the right of the door you entered through. Intel #03: Clearing the prison area, you'll breach into an interrogation room where the Minister is held. There are some shelves to the left of the interrogation room's one-way glass with the collectible. Intel #04: Entering the hangar with the APC, you'll need to shoot missiles to destroy the enemy armored vehicle. Enter the storage room to the left of the entrance and check out the back-right corner, behind a forklift. Intel #05: After your team escapes a robot attack and enters a hangar with a large armored vehicle, don't board just yet. There's a desk in the far back-right corner from the APC with a collectible. Intel #06: In the area where you'll get the option to manually control a drone to destroy the generator, clear out the enemies then enter on foot. About half-way to the generator, you should spot a fallen concrete mixer. There's a broken robot hand here. Intel #07: At the subway station with the blown-out ceiling, go up the stairs on the left to find a platform with the collectible item. Intel #08: Continuing into the underground, you'll reach a maintenance bay with a lower level accessed by stairs. Go down to the sub-level and cross over to the opposite wall lined with metal shelves. The collectible is in the left corner. Intel #09: Just as you appear in the train, you'll be attacked by rogue robots in the second car. Look around the bar on this car to get the collectible. Intel #10: Reach the car where robots drop through a skylight. From here, go upstairs and look on the left-most seat near the steps. Intel #11: At the start of the mission you'll encounter soldiers guarding a street. Once the area is clear, enter the last doorway on the right. There's a store here. Grab the gasmask behind the desk. Intel #12: Moving through the high-winds and going down into the flooded street, you'll reach a multi-level structure with enemies inside. Check to the right of this building's exterior to discover a bench with an urn and incense. Intel #13: On the way to the Comm Hub, you'll need to swim through the subway. As you go underwater, take a turn left and stay near the left wall. Swim straight forward, close to the surface, and you'll run straight into the next collectible. Intel #14: Resurfacing and fighting into the entrance of a high-rise structure, stay on the first floor and look in the open doors behind a bar. There's a room on the left lit with candles containing the helmet collectible. Intel #15: Continuing on to the secondary hub, you'll reach another guarded building. Before going inside, look right to spot a fire escape. Climb all the way to the top, then jump across into the upper floor opposite (back into the same building you were in before) to reach a previously-inaccessible area. In the next office, look right to get the collectible. Intel #16: The last collectible is in the CIA safehouse. Go through the blasted vault doors and upstairs. The collectible is on the left in this room. Intel #17: At the start of the mission, you'll enter combat right away above a covered street. There's a blue building on the right with an open garage facing you. Check inside to grab the first collectible. Intel #18: Continue down the right alley past some market stands with red covers. There's a table in a blue-hued corner near a locked garage door with a collectible souvenir. Intel #19: Moving into the next courtyard, you'll find a scaffolding tower with a turret and sandbags. Look inside the building to the left of the defenses. Go upstairs and look right of the top of the steps. Intel #20: Entering the area with stacks of shipping containers, you can choose to move left or right. Take the right path, pass through the open yellow container with the roof and missing walls, then turn left and jump onto the red containers with the cover walls. To your right there is a blue container with your next collectible inside. Intel #21: Moving through the high walkways inside the 54i tower, you'll enter a museum room with broken aquarium displays. On a pillar in the center, you'll see one broken aquarium. Swivel around to the opposite side of the column. Intel #22: While fighting across the Super Tree towers, you'll need to use a zip-line to reach another tower. Once you land, cross the bridge to the next tower. Here, turn right from the bridge and go down the steps. There's an optional alcove with an collectible and an ammo box. Intel #23: Outside the Coalescence facility, you'll reach a 54i garrison. You can take a stealthy approach here, but before engaging look to the right of the path. There's a ruined yellow tent with a collectible inside. Intel #24: Inside the building's lobby, turn left at the reception desk. The collectible is between two locked doors at the end of the hall. Intel #25: At the 'bottom' of the facility, you'll have to deal with a robot ambush before Hendricks opens the fan in the center of the chamber. Before going down, look in the offices around the circle. There's a glass table inside one where a collectible is located. Intel #26: Inside the Black Site lobby with the lit-up blue insignia, a door will open. Before continuing on, enter the first door on the left. The collectible is to the left just as you enter the office. Intel #27: In the chamber with the skeletal remains, go to the back of the room. There are cabinets along the far wall with a collectible. Intel #28: Stepping out of the flooded area where robots ambush you, take the first turn on the right and look underneath a flickering Coalescence computer monitor bolted to the wall. Intel #29: On the first street with bodies hanging from the lamp posts, back-up and enter an alley along the left side. There's a corner under a light, near a white tarp where you'll find the collectible. Intel #30: In the large area with patrolling guards and curved roofs, Hendricks will give you a silenced sniper rifle. Drop down to street level and enter through the right-most. Pass through the circular passage ahead, then through a second circular entrance, then a third. As you step through the third, turn right. In the garden, there's a well-hidden collectible. Intel #31: In the area where snipers shoot from a parking garage and a large robotic opponent appears, enter the smashed wall the huge robot blew through and look left. Intel #32: Once you return to the burning Singapore safehouse, check out the sitting area to the right to spot the last collectible of Mission 6. Intel #33: Inside the room with the Doctor's interrogation cell, look on a computer desk opposite the objective marker on the door. There's a helmet here you can grab. Intel #34: After fighting off the attack in the Ramses Station main floor, go up the escalators on the left (from where you return) and look for a 'Resort & Bar' sign on the left. Just under this sign, near the wall, is a desk with another collectible. Intel #35: In the area where you'll need to plant spikes into the street and detonate them, start from the mobile wall. Go through the door on the left and look on the left brick wall, near that mobile wall, to find a propaganda poster. Intel #36: Moving on, you'll get a cutscene and appear at the top of a building, leaving through a broken wall to get a look at a destroyed alley. Move along the right-path to a white brick building's door jam. Go down the stairs inside. There's a wrecked living room ahead. The collectible is on the bookshelf near the door, to the left of a couch. Intel #37: In the destroyed lobby of a high-rise with the crashed VTOL, don't enter the vehicle just yet. Check out the sitting area to the right of the VTOL. Intel #38: Dropping down into the monument square guarded by an A.S.P. robot, run into the building with the big '6' sign. Enter the theater, go upstairs, and round the corner into a dead-end with two couches. The collectible is on the table between the couches. Intel #39: Once you arrive in the WW2 battlefield, look for a bunker on the right at the start of the area. Intel #40: Fight through the Nazis ahead and take any of the paths though the hills. Cross the creek, and up another hill there's a covered command post on the left. Look inside to find a radio collectible. Intel #41: In the area where you first encounter the Dire Wolves feeding on bodies, move to the Ammo Resupply Crate. To the left of this crate there's a small wooden box with binoculars. Intel #42: At the occupied town, move along the left side of the battlefield and enter the barn. Go upstairs, there's a collectible near the open door jam straight ahead as you reach the top of the stairs. Intel #43: Continuing on, you'll reach another courtyard down the hill with parked halftracks. Once again, stick to the left side and enter a small storage room filled with wooden crates. In the back-left corner you'll find the next collectible item. Intel #44: After gravity switches, you'll fight your way through more of the town. Move along the right edge and use the hill made of dirt and rubble to reach the second floor window. Check the first door on the right once you're inside. Intel #45: The first time you land on the Mobile Refinery, enter the control room just beneath the objective marker. The collectible is on the desk next to the Ammo Resupply Crate. Intel #46: At the second landing site on the Mobile Refinery, take the first left down an alley with bundles of pipes. Next to those pipes is a collectible. Intel #47: Using the lift to reach a shopping area, enter the convenience store on the left. The collectible is on the back left pillar. Intel #48: After kicking open the air vent (which kills an enemy soldier) you'll drop down and engage the defenders. Clear the room, then look in the bank of lockers on the left of the room. Intel #49: Climbing up to find troops in combat, you'll witness a scene with those annoying explosive roller robots. Near this scene, take the blue-glowing stairs up. At the end of the room, there's a desk with ammo and a collectible. Intel #50: Near the end of the bridge section, just as you climb the gray container attached to the second tower and reach the GO TO objective marker, turn around and explore the roof of the bridge. Under something that looks like an air conditioner unit there's a carpet collectible to take. Intel #51: Moving into a multi-level area filled with enemy robots, you'll need to climb the hill of debris to the crashed elevator shops on the left to reach an impromptu bridge. As you enter the first burnt-out shop, turn left to discover a collectible on the floor. Intel #52: In the VTOL Mothership boss fight arena, enter the building just to the right of your starting position. Intel #53: Just as the mission starts, turn around and look for a storefront called 'Zurich Coffee House' -- the collectible is near the black locked entrance door. Intel #54: Inside the Coalescence HQ, you'll fight your way down into a Nova 6 chemical weapon chamber. Before using the computer console objective, look in the left corner of the room. Intel #55: After burning the second (middle) gate, you'll enter a dream-like area patterned after the Egyptian battlefield. Fight down the hill to a series of mobile walls. On the left, there's a half-fallen building hanging over the abyss. Use the pillars and balconies to climb to the roof where you'll find a very well hidden collectible. Intel #56: At the very end of the game, once the Purging sequence has begun, you'll move back through the Coalescence HQ. Leaving the octagon room, you'll enter an office filled with dead bodies. Look behind the reception desk beneath the huge Coalescence logo. There's a Raven Feather you can take here, completing the collection and unlocking the 'Curator' trophy or achievement.